There may be no greater combination than knitting and a warm beverage. Whether you are a tea drinker, a coffee-holic, or if you enjoy a soothing hot chocolate, any of them go swimmingly with a pair of needles and a ball of wool. 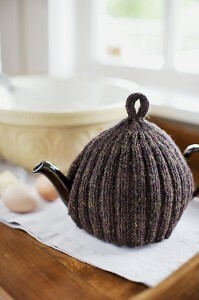 Thus I began my search for a simple, classic looking, tea pot cozy pattern. I think I have found just the pattern and wool combination in a Churchmouse pattern and Harrisville’s Tweed yarn. Churchmouse designs are simple and straightforward, nothing terribly fancy, just well written classics. The ribbed tea cozy (and it’s ruffly counterpart) are done in an 18 stitch gauge yarn and I felt that something rustic and tweedy was in order. Enter the Harrisville’s Tweed. It’s a rustic wool yarn that is light and warm, perfect for keeping tea hot hot hot. Of course some people enjoy getting their warm beverages on the outside and a coffee cozy like this one is just the right thing to bring the warmth of home to your local coffee shop. Something simple to make for you (and an easy peasy gift for others) from your aran/worsted weight scraps.